This randomized, placebo-controlled, double-blind, prospective clinical trial was conducted between June 2007 and June 2009 in the Department of Plastic Surgery, Sri Venkateswara Institute of Medical Sciences University (SVIMS), Tirupati, Andhra Pradesh, India. A sample size of 100 donor site scars was included in this study after considering the difference of score between the two groups, with an alpha error of 5% and study power of 95%. A total number of 100 donor site scars in 50 patients were included in this study. This is because each patient's donor site scar consisted of half control (Group I) and half intervention (Group II). Inclusion criteria were those patients or parents, in case of minors, with a donor site scar after split thickness skin grafting, willing to participate in the study, age between 1 and 75 years, both male and female, donor site scar more than 10 days but not more than 3 weeks after surgery. The exclusion criteria were patients who have undergone full thickness skin grafting, not willing to participate in study, history of hypersensitivity to silicone gel, wound infection at the donor site, donor site scar < 10 days or > 3 weeks after surgery, significant medical or surgical illnesses, hormonal problems, hemolytic disorder, metastatic disease, skin infections, photo exposure, or other conditions likely to change the skin's response to therapy, on medications which interfere with study results. The study was approved by the University Research Ethical Committee. The study was self-funded. An independent pharmacist helped in the blinding process of the placebo and the silicone gel samples. Both types of control and silicone gel samples were prepared alike in term of appearance, smell, and consistency. In this study a semi liquid, stick type of silicone gel was used. The contents of control gel were water, glycerin, propylene glycol, and hydroxyethyl cellulose. A random number table was used by the pharmacist for randomization of the gel samples and site of application. Both types of gel were placed into separate tubes and labeled. The samples were then kept inside an envelope, so that both the doctor and the patients were blinded by this process. Two arms of 50 control (Group I) and 50 silicone gels (Group II) were included in this study. The donor site scar was divided into the upper half and the lower half. Both halves of the scars were randomized into control or intervention scars, and the instructions of gel application to which halves of the scar were labeled at the envelope and tubes. When the tubes were given to the patient, a detailed explanation of the coded gel to apply at which halves of the scar was reinforced. Patients were recruited during the outpatient follow up. The study was explained in the patient own language. Consent was obtained from the patients in the presence of a nurse. Instruction was given to apply the gel two times per day, once in the morning and once before sleep. Gel application started from the 2 nd week until the 8 th week of the postoperative period. The same physician who was blinded to the study scored all the scars, so that any inter observer differences were eliminated. This was performed at the 2 nd , 6 th , and 8 th weeks of the postoperative outpatient follow up. A performa sheet was used to collect the patient data and scars score. The Vancouver scar scale was selected for the study, because it is widely used for scar assessment. All the scars in this study had been standardized in all possible aspects, such as age of the scar, location over the donor site area, type of surgery, and single surgeon performing the procedure. After completion of data collection, the decoding of blinded samples was performed with the pharmacist's help. The data were recorded and analyzed using SPSS version 16.0. The Wilcoxon signed-rank test was used to test for any significant difference of various scar parameters between the two groups. A total number of 100 scars in 50 patients were included in this study. This is because each patient's scar consisted of half control scar and half intervention scar. The patients' ages ranged from 1 to 75 years. The median age was 25.5 years and the interquartile range was 9.25-37.5 years. There were 30 men (60%) and 20 women (40%) in the study. There were differences in the tendency to form hypertrophic scar among the different age and gender. Males developed more hypertrophic scar than females. Age group ranging 5-15 years developed more hypertrophic scar compared to other age groups. But development of hypertrophic scar has dependence on age and gender was not established statistically (P > 0.05). The commonest indication for which split thickness skin grafting performed was release of post burn contractures (62%). The co-morbidities found in the study population were 39 with none (78%), 3 with diabetes mellitus (6%), 4 with hypertension (8%), 3 with diabetes and hypertension (6%), and 1 with chronic obstructive airway disease (2%). The co-morbid factors did not have any effect on hypertrophic scar formation in this study. Thirty-seven patients (74%) had good compliance and never forgot to apply the gel. The 12 patients (24%) who had moderate compliance sometimes forgot to apply the gel. One patient (2%) had poor compliance, as he forgot most of the time to apply the gel because he did not have any scar. 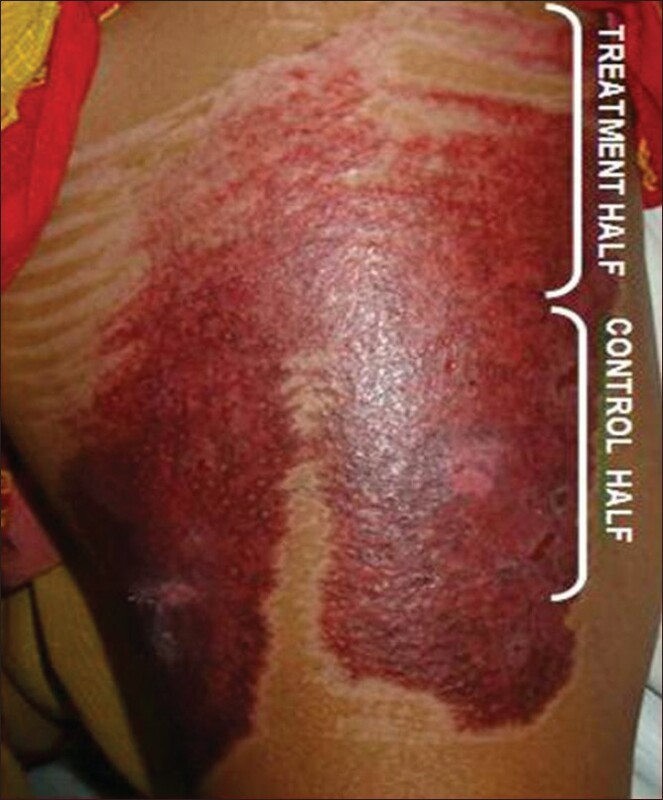 Compliance can be affected by good scar healing. There was no side effect of the silicone gel noted in any of the 50 patients. There was no side effect seen in those treated with control gel either. The incidence of hypertrophic scar was 94% (47 out of 50), but the scars formed in the silicone group were much smaller compared with those in the control group [Figure 1]. 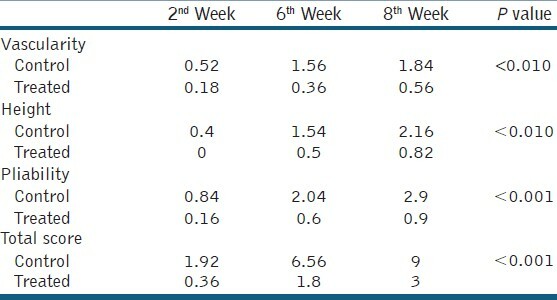 The mean scores of the different parameters for the three visits are summarized in [Table 1]. The control group showed a gradual increase of scar score in all parameters. The final assessment at 8 th week showed that differences observed between the two groups were statistically significant (P < 0.05). Skin grafting is a transplantation of skin from one place (Donor site) to another place (Recipient site). During the scar maturation, there is tendency for hypertrophic scar development especially at donor site of skin grafting. Once hypertrophy is developed treatment is longer, costlier and difficult to cure. Successful scar preventive measures can prevent a patient's functional, cosmetic, and psychological morbidities. In patients with established hypertrophic scar, the silicone gel doesn't show much improvement. Thus, the measure of scar prevention during wound epithelialization and the early phase of scar maturation important. Silicone materials are synthetic polymers containing a silicon-oxygen backbone and organic groups attached directly to the silicon atom by silicon-carbon bonds. Depending upon the length of the polymer chain and the degree of cross-linking, the silicone can be a fluid, gel, or rubber. Silicon is inert and does not inhibit microbial growth, but it can act as a bacterial barrier. Under the electron microscope, the surface of silicone gel sheet is flat and has no pores. Because it has a water vapor transmission rate lower than skin, the water that accumulates below the silicone gel sheet can cause skin maceration. An Australian research group developed the earliest silicone gel sheet. It was used for scars that were located at anatomical depressions and flexures under the pressure garments. The researcher used them at 6-8 weeks after burn injury when the scar started to develop. Quinn, et al., introduced nonpressure treatment of hypertrophic scars in 1985. The silicone gel sheet needs to be in contact with the skin surface for as long as possible. Previous reports indicate that the duration of the silicone sheet use ranged from 12 to 24 hours daily. It needs to be washed and reapplied after 24 hours. However, it causes pruritus (80%), rash (28%), maceration (16%), and foul smells (4%) in hot climate. If the above side effects develop, patients are advised to discontinue immediately and resume using it once the symptoms have resolved. The modification of this semi-liquid sticky form of silicone gel has eliminated the above side effects and improved patient compliance. In the study by Chan, et al., the patients' co-morbidities did not seem to have any effect on scar development in their patients. The general belief of delayed wound healing usually found in diabetic and hypertensive patients was not confirmed by our study. None of the diabetic patients had superficial wound infection. In the study of Chan, et al.,  compliance with therapy was good in 74% of patients, with just two applications per day. In our study compliance was also good in 74% patients. The semi liquid, sticky gel is easy to apply and stays on the skin for many hours. Some patients did not understand the importance of the preventive role of gel application during early phase of wound healing when the scar was still not prominent. Compliance improved when patients noticed early scar formation. According to the study of Sepehrmanesh, et al.,  silicone gel is a non-adhesive gel which can be used for the treatment of scars following completion of the wound healing process. It is indicated for the prevention and treatment of hypertrophic scars and keloids following surgical intervention, following accidents, trauma, or other incidents. Due to its transparency it can be used on visible skin areas: An important esthetic aspect. Silicone gel dries quickly and can be used under make-up. It is elastic and stretchable, it can be applied to exposed parts of the body and suitable for children, who do not easily tolerate plasters and sheets. Due to the inert characteristics of the polysiloxanes silicone gel is very well tolerated by the skin, this is very important for the treatment of children's sensitive skin. It does not have to be cut to fit to the scar areas, or be fixed in place or cleaned. In our study, we noted all the above advantages and characteristics of silicone gel. In the study of Sebastian, et al.,  changes in the parameters redness, pain, hardness, elevation, and itchiness were scored on a range scale, and a statistical evaluation was performed by Wilcoxon signed-rank test. Changes in scores were compared between baseline and last evaluation and were statistically significant (P < 0.05 Wilcoxon test). In our study, as per the Vancouver scar scale all the parameters (vascularity, pigmentation, pliability, and height) showed statistically significant difference (P < 0.05 Wilcoxon test) between the control and treated groups [Table 1]. There are limitations in the study like supervised application as admitted patient was not possible as once skin grafting procedure is completed for particular reason patient was reluctant to stay for donor site management. Although patients were explained and demonstrated the application of gel still, the possibility of mistake at home cannot be ruled out. Patients were usually reluctant for follow-up because of distance and loss of interest in scar management. Once patients get good scarring they forget application of silicone gel regularly which affects the compliance. There is high incidence of hypertrophic scarring at donor site of skin grafting observed in this hospital. Silicone gel is effective in the prevention of hypertrophic scarring at donor site of skin grafting. Severity of hypertrophic scarring was less in treated group than control group which is observed clinically and statistically. Success of silicone gel in its prophylactic role will create new issues such as its routine use in all operations. A longer follow-up is required to assess any recurrence after cessation of silicone gel. The authors thanks the outpatient clinics staff for helping in scheduling all the patients' appointments and appreciate the assistance of the pharmacist in blinding and preparing the gel for all patients. 1. Sproat JE, Dalcin A, Weitauer N, Roberts RS. Hypertrophic sternal scars: Silicone gel sheet versus kenalog injection treatment. Plast Reconstr Surg 1992;90:988-92. 2. Cruz-Korchin NI. Effectiveness of silicon sheets in the prevention of hypertrophic breast scars. Ann Plast Surg 1996;37:345-8. 3. Ahn ST, Monafo WW, Mustoe TA. Topical silicone gel for the prevention and treatment of hypertrophic scars. Arch Surg 1991;126:499-504. 4. Nedelec B, Shankowsky HA, Tredget EE. Rating the resolving hypertrophic scar: Comparison of the vancouver scar scale and scar volume. J Burn Care Rehabil 2000;21:205-12. 5. Beau sang E, Floyd H, Dunn KW, Orton CI, Ferguson MW. A new quantitative scale for clinical scar assessment. Plast Reconstr Surg 1998;102:1954-61. 6. Peacock EE, Madden JW, Trier WC. Biologic basis for the treatment of keloids and hypertrophic scars. South Med J 1970;63:755-60. 7. Levier RR, Harrison MC, Cook RR, Lane TH. What is silicone? Plast Reconstr Surg 1993;92:163-7. 8. Perkins K, Davey RB, Wallis KA. Silicone gel: A new treatment for burn scars and contractures. Burns 1982;9:201-4. 9. Quinn KJ, Evans JH, Courtney JM, Gaylor JD, Reid WH. Non-pressure treatment of hypertrophic scars. Burns Incl Therm Inj 1985;12:102-8. 10. Nikkonen MM, Pitkanen JM, Al-Qattan MM. Problems associated with the use of silicone gel sheeting for hypertrophic scars in the hot climate of Saudi Arabia. Burns 2001;27:498-501. 11. McCauley RL, Riley WB Jr, Juliano RA, Brown P, Evans MJ, Robson MC. In vitro alterations in human fibroblast behavior secondary to silicone polymers. J Surg Res 1990;49:103-9. 12. Niessen FB, Spauwen PH, Robinson PH, Fidler V, Kon M. The use of silicone occlusive sheeting (Sil-K) and silicone occlusive gel (Epiderm) in the prevention of hypertrophic scar formation. Plast Reconstr Surg 1998;102:1962-72. 13. Clugston PA, Vistnes MD, Perry LC, Maxwell GP, Fisher J. Evaluation of silicone-gel sheeting on early wound healing of linear incisions. Ann Plast Surg 1995;34:12-5. 14. Chan KY, Lau CL, Adeeb SM, Somasundaram S, Nasir Zahari M. A randomized, placebo-controlled, double-blind, prospective clinical trial of silicone gel in prevention of hypertrophic scar development in median sternotomy wound. Plast Reconstr Surg 2005;116:1013-20. 15. Sepehrmanesh M. Scar management: Observational study of 1552 patients using the kelocote silicone gel. Compendium Dermatologic 2006;1:30-2. 16. O'Sullivan ST, O'Shaughnessy M, O'Connor TP. Etiology and management of hypertrophic scars and keloids. Ann R Coll Surg Engl 1996;78:168-75. 17. Draaijers LJ, Templeman FR, Botman YA, Tuinebreijer WE, Middelkoop E, Kreis RW, et al. The patient and observer scar assessment scale: A reliable and feasible tool for scar evaluation. Plast Reconstr Surg 2004;113:1966-7. 18. Espana A, Solano T, Quintanilla E. Bleomycin in the treatment of keloids and hypertrophic scars by multiple needle punctures. Dermatol Surg 2001;27:23-7. 19. Sebastian G. Topical application of silicone gel in hypertrophic scars and keloids. Dermatol 2004;30:450-1.